Piso Fare 2019 Promos Until 2020: Cebu Pacific's 75% Off Promo to all International Destinations! 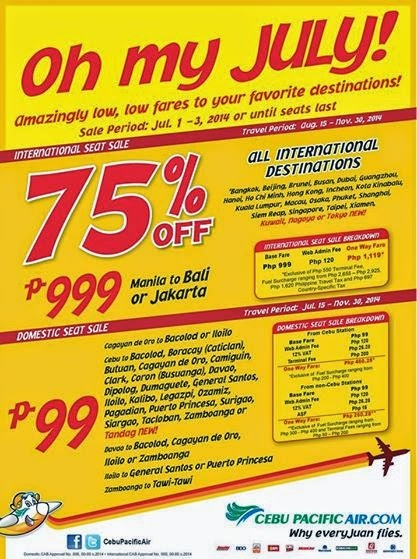 Cebu Pacific's 75% Off Promo to all International Destinations! Piso Fare Promo : It's definitely good bye, JUNE and Hello to July! For that, Cebu Pacific is launching their 75% off promo on base fare for ALL International Destinations. So where will you go? Choose from Bangkok, Beijing, Brunei, Busan, Dubai, Guangzhou, Hanoi, Ho Chi Minh, Hong Kong, Incheon, Kota Kinabalu, Kuala Lumpur, Macau, Osaka,Phuket, Shanghai, Siem Reap, Singapore,Taipei, Xiamen, Kuwait, Sydney, Nagoya or Tokyo.